OBJECTIVE: As sub-Saharan Africa is highly endemic for hepatitis B virus (HBV) and human immunodeficiency virus (HIV) infections, and their co-infection requires special management, we aimed to assess the serological and molecular characteristics of HBV in patients with AIDS. DESIGN: This was a cross-sectional, case control study, which enrolled 200 patients with AIDS and 200 HIV-negative controls. HBV serology was done in all participants and HCV serology in participants with a hepatitis B core antibody (anti-HBc) only serological pattern. Nested HBV polymerase chain reaction (PCR) and HBV viral load assays were used for HBV molecular detection. RESULTS: Hepatitis B surface antigen (HBsAg) prevalence was 3-fold higher while the "anti-HBc only" pattern was 6-fold higher in the AIDS group compared with the controls. Mean HBV viral load was significantly higher in HBsAg-positive patients with CD4+ cell counts <100 cells/μl than in patients with CD4+ cell counts of 100-200 cells/μl (p=0.019). There were markedly reduced hepatitis B surface antibody (anti-HBs) titres in the AIDS group compared with the controls (p=0.002). A significant proportion of AIDS patients with an "anti-HBc only" pattern had CD4+ cell counts <100 cells/μl (p=0.004). Occult HBV prevalence was 3.5% in the AIDS group compared with 1% in the controls (p=0.092). When occult HBV infection was taken into consideration, the overall HBV prevalence became 10% in the AIDS group and 3% in the control group. CONCLUSION: We showed an increased HBV prevalence in patients with AIDS and identified a CD4+ cell count <100 cells/μl as a major risk factor for the "anti-HBc only" pattern and increased HBV replication. These data have significant public health implications for HBV in developing countries, especially in areas where antiretroviral (ARV) guidelines do not cater for HBV/HIV co-infection. This cross-sectional, case-control study was conducted in an urban, secondary hospital (Tshwane District Hospital, Pretoria), Gauteng province, South Africa. Four hundred South African participants (200 patients with AIDS and 200 HIV-negative participants) were enrolled from June 2007 to January 2009. AIDS was defined as CD4+ cell count of <200 cells/µl in patients infected with HIV. All participants were recruited from the same centre, Tshwane District Hospital HIV Clinic, which offers both HIV testing and antiretrovirals (ARVs), e.g. if tested positive for HIV at a voluntary counselling and testing (VCT) section, patients get referred to the ARV section of the clinic. HIV-negative participants (control group) were identified and recruited after HIV testing, while participants with AIDS were recruited from the HIV clinic before starting ARV treatment. The minimum age requirement for enrollment was 18 years. Questionnaire forms were used to collect participants' demographic and HBV risk-assessment data. Ethics approval for this study was granted by the University of Pretoria, and written informed consent was obtained from all participants before enrollment. Viral nucleic acid was extracted from 100 µl of plasma using the MagNa Pure LC Total Nucleic Acid Isolation kit in the MagNa Pure LC instrument (Roche Diagnostics, Germany) according to manufacturer's instructions. Nested HBV DNA polymerase chain reaction (PCR) assay (qualitative in-house assay) was performed to detect occult HBV infections in participants who were HBsAgnegative after HBV serological screening. HBV core primers were used for nested HBV-PCR as previously described.11 The sensitivity of the nested HBV-PCR was determined by serial dilution (10-fold dilutions: 10-1-10-7) of samples with known HBV viral loads. HBV viral loads were determined by Cobas TaqMan 48 HBV assay (Roche Molecular Systems, Inc., Branchburg, USA) for all HBsAg-positive participants, those with 'anti-HBc only' pattern and in those positive on nested HBV PCR. Epics and UniCel DxC880i analysers (Beckman Coulter Diagnostics) were used for CD4 count measurements and liver function tests (LFTs), respectively. HBsAg prevalence of 6.5% in the AIDS group was significantly higher than that of 2% in the control group. 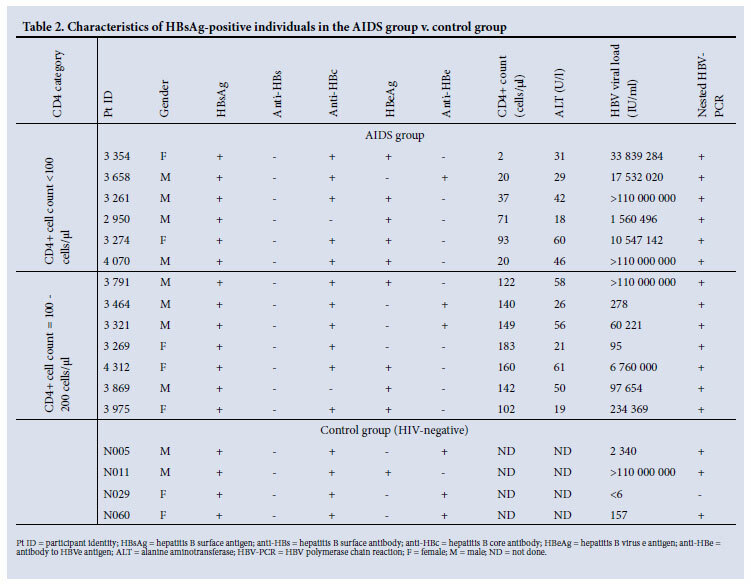 The total HBV exposure was significantly higher in the AIDS group compared with the control group, and the same trend was also noticed for both HBeAg and 'anti-HBc only' prevalence (Table 1). When stratifying the HBsAgpositive AIDS participants by CD4+ cell counts, the group with CD4+ cell counts of <100 cells/µl had a higher HBeAg prevalence of 83.0% (5 of 6) compared with 57.1% (4 of 7) in the group with CD4+ cell counts of 100 -200 cells/µl; however, this difference was not statistically significant (p=0.680). HBeAg prevalence was 25% (1 of 4) in HBsAg-positive participants in the control group (Table 2). Two HBsAg-positive patients with AIDS had negative anti-HBc (Table 2). 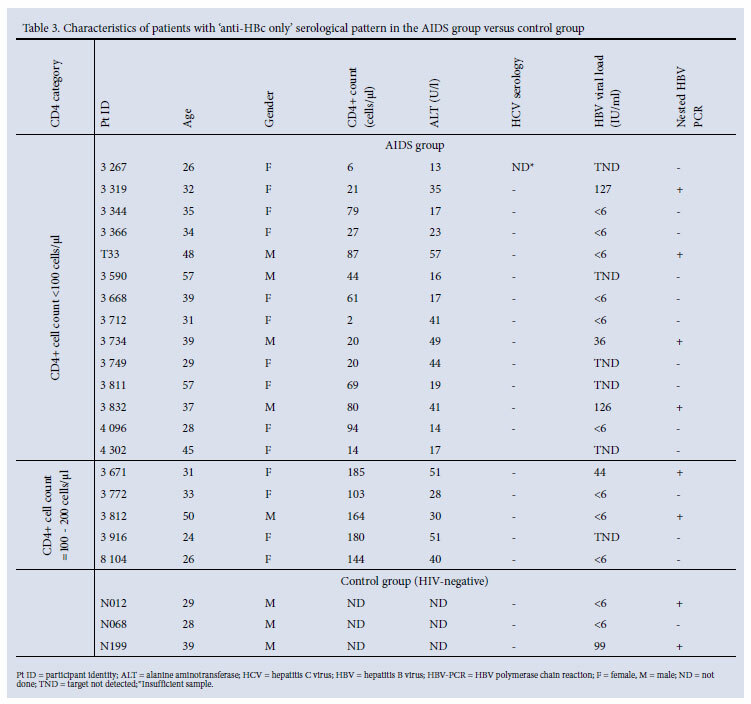 The 'anti-HBc only' serological pattern was 6-fold higher in the AIDS group compared with the control group (Table 1). When patients with an 'anti-HBc only' serology in the AIDS group were stratified according to CD4+ cell counts, 73.7% (14 of 19) had CD4+ cell counts of <100 cells/µl compared with 26.3% (5 of 19) in the group with CD4+ cell counts of 100 - 200 cells/µl (p=0.004) (Table 3). HCV serology results were negative in all patients with an 'anti-HBc only' pattern (Table 3). The lower detection limit of the HBV viral load assay was 6 IU/ ml (~30 copies/ml). Mean HBV viral loads were significantly higher in HBsAg-positive patients with CD4+ cell counts of <100 cells/µl compared with the group with CD4+ cell counts of 100 200 cells/µl (p=0.019) (Table 2). HBV viral load values >110 000 000 IU/ml were excluded from the comparison between these groups as they are outliers (fall outside the reference range). Interestingly, even the HBeAg-negative (but anti-HBe-positive) patient (3 658) with a CD4+ cell count of <100 cells/µl (Table 2) had a very high HBV viral load compared with counterparts (3 464 and 3 321) with CD4+ cell counts of 100 - 200 cells/µl. 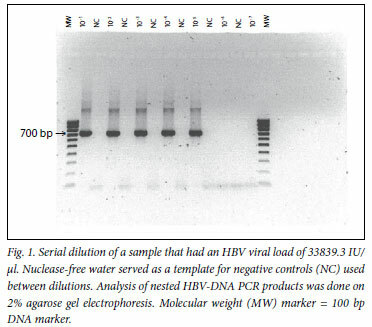 Nested HBV-PCR was used for detection of occult HBV infection, and its performance was assessed in all HBsAg-positive samples; it was positive in all these samples except for one that had a <6 IU/ml viral load (with an HBsAg titre of 217.04 S/N) (Table 2). Its lower detection limit was 0.2 IU/µl (~1 copy/µl) on serial dilution of HBsAg-positive samples with known viral loads (Fig. 1). This high sensitivity of nested HBV-PCR was noticed in some samples where HBV viral load was <6 IU/ml, but nested PCR was clearly positive (Table 3). Occult HBV infection was detected in most participants with 'anti-HBc only' serological picture (Table 3) and in one participant who was positive for both anti-HBc and anti-HBs (confirmed on repeat serology). The latter had an anti-HBs titre of 15 mIU/ml, a CD4+ cell count of 72 cells/µl, positive nested HBV-PCR, HBV viral load of 290 IU/ml, and alanine aminotransferase (ALT) of 16 IU/l. In total, occult HBV prevalence was 3.5% in the AIDS group compared with 1% in the control group (p-value - 0.092). Only one patient with occult HBV infection had an HBV viral load of >200 IU/ml (mentioned above). Contamination was successfully avoided in the nested PCR runs as all negative controls used at the end of each run or in between samples were negative (e.g. Fig. 1). Subsequently, all positive samples on nested PCR were sequenced, and the phylogenetic tree also did not show any indication of contamination (data not shown). When occult HBV infection was taken into consideration, the overall HBV prevalence in this study became 10% in the AIDS group and 3% in the control group. HBV prevalence varies considerably in South Africa owing to gender, age, race and geographic location of a studied population, e.g. blacks, males, and residence in the rural or coastal areas such as Eastern Cape and KwaZulu-Natal (KZN) are risk factors associated with high HBV prevalence. This prevalence could be as high as 10% or more in those at high risk for HBV and as low as 1% in low risk groups as noted in children born into an urban environment.2 There was a lower HBV prevalence in the control group despite more risk factors for chronic HBV prevalence such as higher number of males and IV drug users (Table 1). South African studies have also shown an increased HBV prevalence in adult patients infected with HIV;5,6 one reported a 22.9% and the other a 5% HBsAg prevalence. However, the latter study used an HBsAg prevalence of 1% as a reference point even though this prevalence rate was only noticed among a group of children born in an urban area, and would therefore be inappropriate for a diverse adult population in terms of risk factors for HBV. Although there is uncertainty regarding the clinical significance of occult HBV infection, a clear association of occult HBV infection and liver disease in the absence of other causes such as HCV infection or alcohol abuse has been described.10 The prevalence of occult HBV ranges from 0% to 10% among individuals without liver disease, 11% to 19% in patients with chronic hepatitis, 12% to 61% in patients with hepatocellular carcinoma, and 1% to 95% in patients with HCV infection.22 It would be difficult to diagnose occult HBV infection in patients with AIDS as some guidelines utilise only HBsAg for HBV screening.19,23 More data are needed on occult HBV infection to elucidate its role in clinical disease in HIV co-infected patients, especially in areas of high HBV endemicity. Markedly reduced anti-HBs titres could explain the high HBsAg prevalence and 'anti-HBc only' presentation in patients with AIDS, as some of these individuals eventually lose protective antibodies. This loss of HBV protective immunity may lead to reactivation of HBV, or exposure to new HBV infections. As patients infected with HIV lose protective antibody levels more quickly (40% loss in 1 year vs 5% loss in HIV-negative individuals),24,25 it may be a good practice to administer HBV vaccine booster doses to those with relatively low anti-HBs titres prior to commencement of HAART. Some experts use anti-HBs levels of less than 100 IU/l as a cut-off point for HBV vaccine booster doses in HIV-infected individuals,26 and our findings support this practice and reinforce its value in HIV endemic countries. The lack of HBV immunity in 60.5% of patients with AIDS could be explained by the fact that HBV vaccine was only implemented in the South African Expanded Programme on Immunisation (EPI) in 1995 and then not routinely offered to adults. Patients infected with HIV but with no HBV immunity should be considered for HBV vaccination to prevent HBV co-infection. Hepatitis B vaccine response in patients infected with HIV correlates with the CD4+ cell counts (87%, 33% and 25% in CD4 count >500, 200 - 500 and <200 cells/µl, respectively).24 Therefore, HBV vaccination of patients infected with HIV may be most costeffective in patients with CD4 count >500 cells/µl. In addition to using HBsAg in the HBV screening protocol, HIV management guidelines for developing countries should also incorporate anti-HBs to identify patients with low or no HBV immunity. This study demonstrated a significantly increased HBV prevalence and decreased anti-HBs titres in patients with AIDS, and also identified a CD4+ cell count of <100 cells/µl as a major risk factor for the 'anti-HBc only' serological pattern and increased HBV replication. There was an increased prevalence of occult HBV infection in patients with AIDS. These findings have important diagnostic and treatment implications for HBV in patients with AIDS, especially in areas with a high burden of HIV and HBV infections. Therefore, a more comprehensive HBV screening programme is recommended for adequate management of HBV in HIV/AIDS. This should include HBsAg and anti-HBs, to identify HBsAg-positive individuals and also those with no HBV immunity or low anti-HBs titres. Although this comprehensive HBV screening has cost implications, it could be cost-effective even in resource-constrained settings when HBV vaccine is made available for prevention of HBV in patients infected with HIV. Early initiation of HAART should be considered in HBV/ HIV co-infection to avoid HBV disease progression and IRIS, which are more likely to occur at low CD4+ cell counts. The limitations of this study include the small sample size, and the inability to exclude other factors associated with isolated anti-HBc such as the 'HBsAg window period' of acute HBV infection.